Beautiful and romantic, this three stone engagement ring features a cushion cut center stone embraced by a pair of matched heart shaped side diamonds. The cathedral shank soars in a graceful silhouette while a dazzling halo lends scintillating sparkle. Accent diamonds follow the line of the shank, bringing fire and life to the irresistible design. *Setting does not include the center diamond. 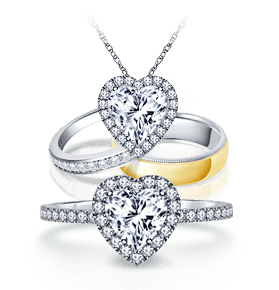 Price will vary depending on metal and diamond side stone selections. 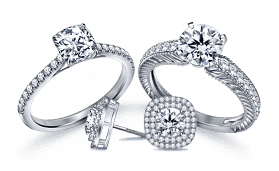 The Cinora line of rings are custom designed based on your choice of center diamond and personal preferences. Once you submit your contact information, our designers will reach out to you to discuss your exact requirements and provide a custom quote for this item. Select Via Email Via Phone contact by field is required. Thank you for submitting your request for a custom Cinora design. A customer service representative will contact you within 24 hours to discuss your requirements. Minimum Carat Weight(ct. tw.) : 0.40 cttw. 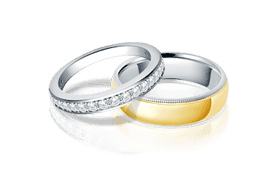 The Cinora line of rings are custom designed based on your choice of center diamond and personal preferences. Submit a quote request and one of our designers will reach out to you with a custom quote based on your exact requirements.